Are you ready for the guessing game??? Okay...so it's not rocket science...I just want you to look at the photo and tell me what the fruit/veg will become!! Maybe not telling you whether it will be fruit or veg is me being a little sneaky or maybe it's because I'm not sure what class it goes into...that you will have to try and figure for yourselves. I know what seed was planted...where the seedling was put...and what goes next to it...maybe these factors might change things and maybe not, all I know is I am looking forward to seeing answers from you all!! So here is the mystery fruit/veg. I promise this photo had not been altered in any way!! Oh and just to finish off...here is a photo of the purple peas...only the pods are purple though...you open up to normal juicy green peas!! I agree with Ann, a zucchini, which left too long can become a monster in a matter of days. 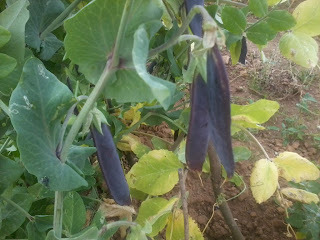 I have grown a round variety also.The peas look fun, I like veggies with a different color. Gotta be a baby marrow. We call them courgettes. Yep, looks like a stunted courgette to me. A friend's daughter planted a 'goth' garden that those peas would fit right into. Is that Winter Melon? Can figured out the size from the picture. Thank you for your kind words and support Tanya. They really means a lot to me. I am with the rest on this either a large fat courgette or a small fat marrow. Scientifically a fruit but tends to be called a vegetable- one confused edible. keep it clean...keep it relevant...I look forward to reading your comments! !